Dr. Julie Loisel (center, back row) and the Patagonia expedition team. Photo by Patrick Campbell. 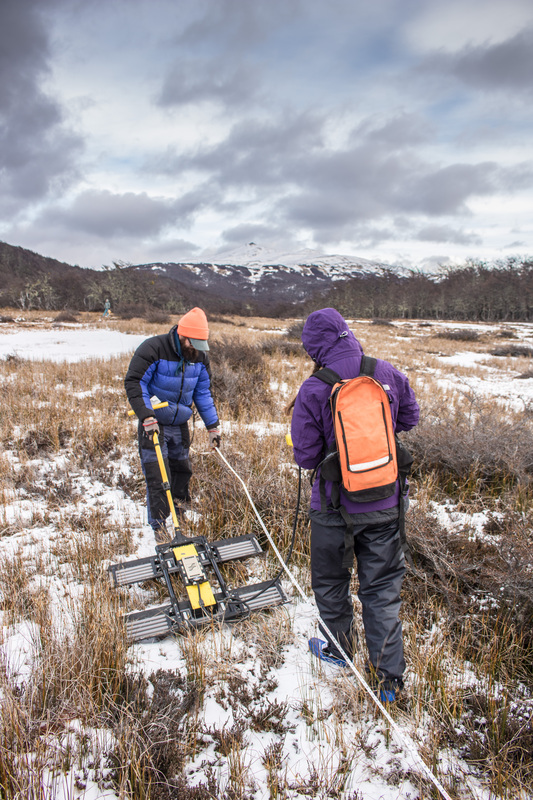 Collecting peat samples from frozen land is far from the beach vacation most students imagine for their summer breaks. But for five Aggie geography majors, a freezing summer field expedition to the far reaches of the southern hemisphere was unforgettable. 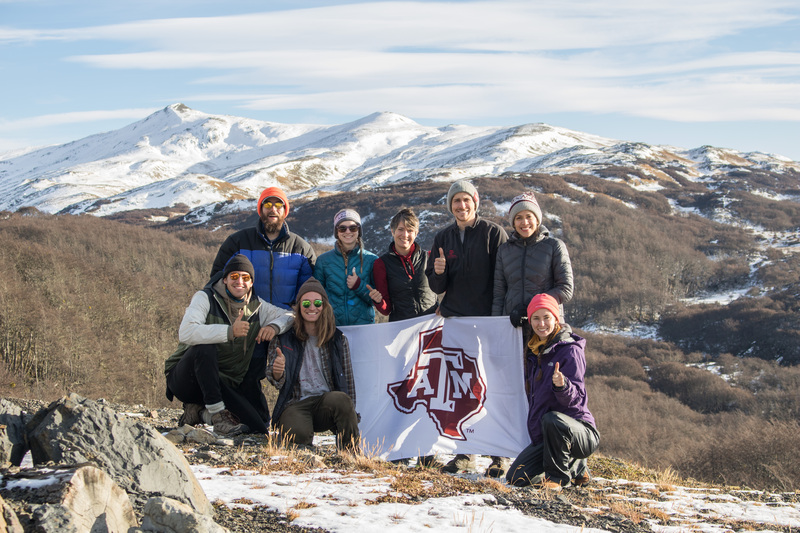 From May 21 to June 8, 2018, Texas A&M University Department of Geography Assistant Professor and National Geographic Explorer Dr. Julie Loisel led a group of five current undergraduate students, along with a geophysicist from the University of Wyoming, Dr. Andrew Parsekian, to Tierra del Fuego, in southern Patagonia, Chile. Patrick Campbell ’18, geography major, served as photographer and videographer on the trip. 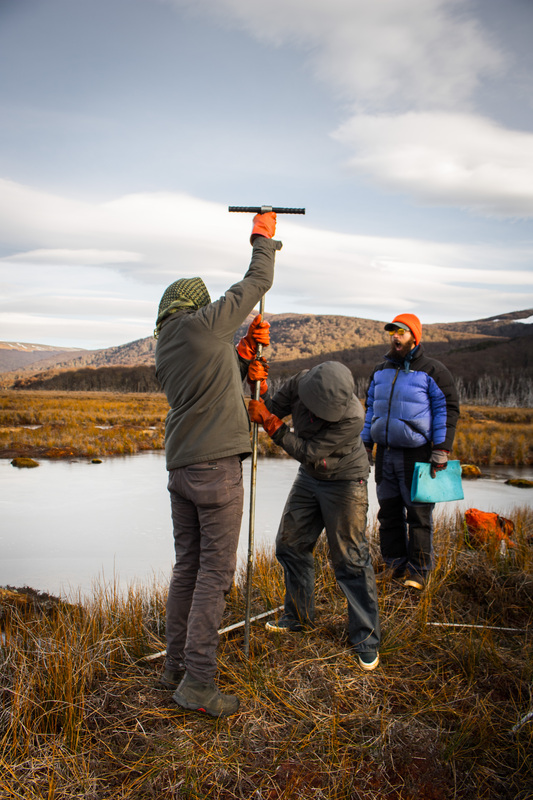 Funded by a grant from the National Geographic Society, the expedition’s objective was to sample peatlands and determine carbon stocks using peat cores and ground-penetrating radar. The process of sampling each peatland location included: coring, subsurface GPR mapping and collecting surface vegetation samples. The team also set up a weather station and water-level data loggers in monitoring wells. Peatlands are unique environments that hold deep layers of important environmental data. Peatlands are also “the most effective sink of carbon on the planet,” Loisel said. The journey to get to southern Patagonia and to their final destination – Karukinka Park – was long. The research crew flew more than 10 hours total, Loisel said, in addition to a day-long drive that included a ferry ride across the Magellan Strait. On the last leg of the trip, the crew stopped along the way to explore a shipwreck and see a rare colony of King Penguins. Karukinka translates to ‘our land,’ “which accurately describes the park and its purpose,” Loisel said. The park has goals that revolve around conservation and sustainability and is only open to visitors who come to learn, research and discover. The base camp that the students would call home for the duration of the trip had no running water and only minimal electricity. It was almost Winter Solstice during their time there, so the sun set around 5:30 p.m. and rose at 10 a.m. The students had to chop wood to fuel the house’s fires, both for warmth and for cooking their meals. “The long dark hours spent together in the cabins helped the group establish a strong bond with each other,” she said. Peatlands store large quantities of carbon within their thick soil layers over thousands of years, which causes them to act as a cooling climate agent on a global scale, Loisel said. They also contain decomposed plant fragments, volcanic ash and many other relicts from the past that can date back thousands of years. She explained that peat deposits can be cored, and their layers read like a history book. Peat cores are a sort of natural time capsule, and their content reveals important information about the local and regional environment. Students map the ground to prepare to collect peat samples. Photo by Patrick Campbell. Students collect peat core samples from the ground. Photo by Patrick Campbell. The first collection site was called Rasmussen Peatland. Located at higher elevation towards the Cordillera Darwin, this Peatland was harsh with freezing air temperatures and strong winds. The Peatland surface was frozen and covered with iced-over puddles. “Obtaining core samples there provided good training for new members, interesting vegetation and beautiful views,” Loisel said. Next the crew traveled to Flarks Peatland. This area was different from the previous one; in a milder valley, its vegetation was more lush and displayed bright colors of reds, oranges, and yellows. This Peatland had also been cut down by the eroding action of a river, which allowed the team to observe the peat layers directly. Over the next four days, the team traveled to four more sites. To learn more about this research, view Campbell’s photo journal and video.